Forget gourmet meals that take hours to make and require too many pots and pans. These one-pan recipes deliver restaurant-style flavor in less than half an hour, from start to finish! Developed by Hungry Girl. Brought to you by Dorot and Pop & Cook. Hate peeling garlic? (We do too!) 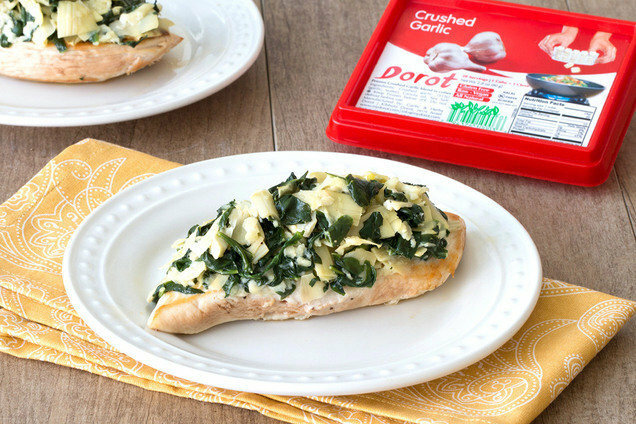 Well, prepare to fall in love with Dorot Crushed Garlic: flash-frozen cubes that you just pop into the skillet! All-natural, pre-portioned, and a major timesaver, it makes this incredible recipe even easier to whip up. Try all the Dorot varieties! Find 'em in the freezer at supermarkets and under the name Pop & Cook at Walmart stores. Pound chicken breast to 1/2-inch thickness, and season with salt and pepper. Bring a large skillet sprayed with nonstick spray to medium heat. Cook chicken for about 4 minutes per side, until cooked through. Plate chicken, and cover to keep warm. Remove skillet from heat; clean, if needed. Re-spray and return to medium heat. Add spinach, chopped artichoke hearts, and Dorot or Pop & Cook Crushed Garlic cube. Cook and stir until spinach has wilted, artichoke hearts are hot, and garlic has thawed, about 2 minutes. Reduce heat to medium low. Add sour cream, mozzarella, and Parm. Cook and stir until hot and well mixed, about 1 minute. Top chicken with skillet contents. 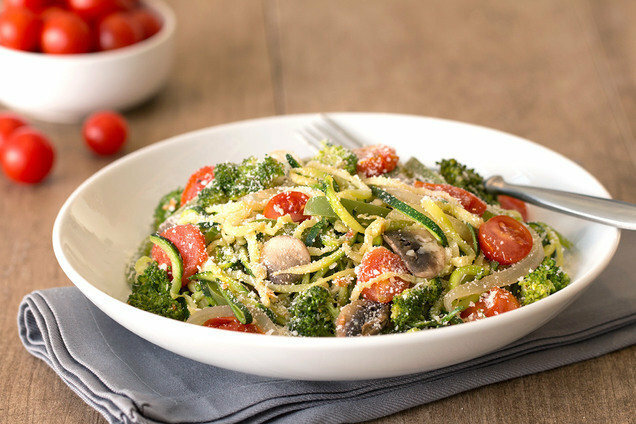 "Primavera" is Italian for "spring," but we recommend that you make this delicious dish all year long! Using a spiral vegetable slicer, cut zucchini into spaghetti-like noodles. (If you don't have a spiral veggie slicer, peel zucchini into thin strips, rotating the zucchini after each strip.) Roughly chop for shorter noodles. Bring an extra-large skillet sprayed with nonstick spray to medium-high heat. Cook and stir zucchini until hot and slightly softened, about 2 minutes. Transfer zucchini to a strainer, and thoroughly drain excess liquid. Remove skillet from heat. Re-spray, and bring to medium heat. Add onion, bell pepper, mushrooms, broccoli, and 1/4 cup water. Cover and cook for 4 minutes, or until veggies are tender and water has evaporated. Add drained zucchini and all remaining ingredients except Parm. Cook and stir until entire dish is hot and garlic is fragrant, about 2 minutes. Stir in 2 tbsp. Parm. Serve topped with remaining 2 tbsp. Parm. Save the day! Click "Send to a Friend" so your pals can enjoy these dishes tonight.